As soon as the snow melts, before anything even blooms, there is color. 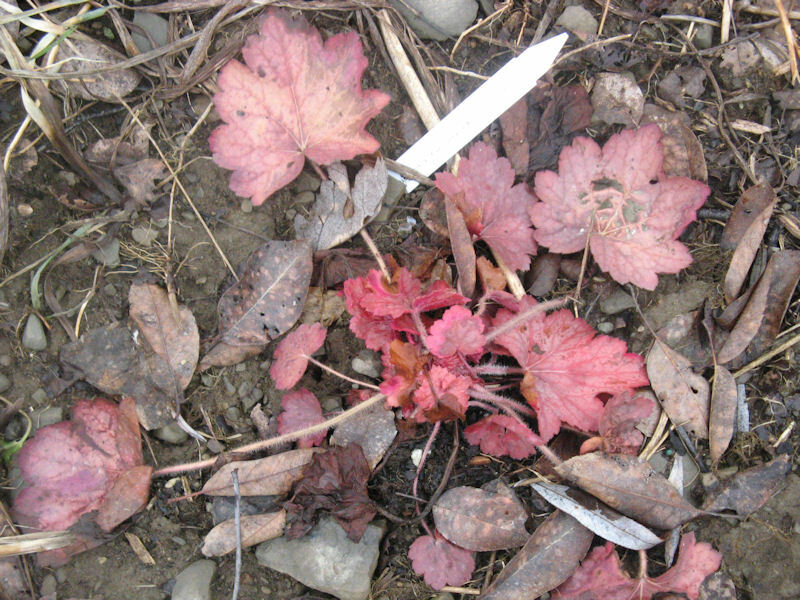 'Pistache' heuchera, a trial plant from Skagit Gardens, was the last plant glowing in autumn and the first to shine in spring. If you are aware that some plants can grow underneath the snow, this is not a complete surprise, though I always marvel when it is an attractive garden plant that pulls this trick, and not just the tap-rooted and creeping weeds. The first flowers are not far behind, however. My first blooms of 2009 opened on March 7th. These winter aconites were shared with me by another garden blogger. When I learned that Galanthus ‘S. Arnott’ bloomed earlier than the G. nivalis snowdrops along the Secret Garden path, I divided them last spring and put some by the kitchen door. Encouraged by heat radiating from the concrete step, these snowdrops bloom earlier than any others. The first crocus, soon to be joined by many more. Hi Kathy its Rosie here from Scotland popping over to say hello and have a wee lookie to see whats blooming over at your place. You must have had it really cold but is’nt good to know that the Pistache heuchera on trial is going to be a winner if it can cope with this last winter. I’ve a terrible habit of when I see a snowdrop I want to see what it looks like up underneath the petals – you’ll see what I mean if you go to my GBBD post! Good to finally see some flowers in your garden. I love the fact that underneath 4′ of snow, the heucheras are in bloom! 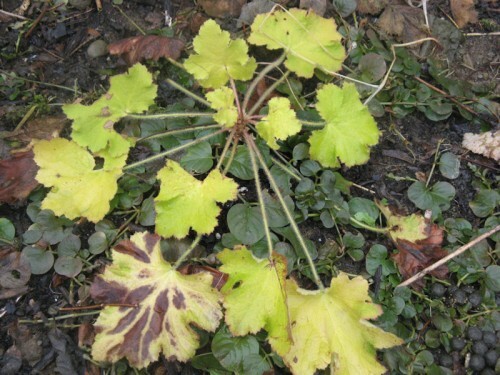 I too was noticing recently how well the heuchera fares through the snow and cold. I haven’t seen a crocus yet, but I’m hoping they’ll show up soon. I have seeds of aconite from a friend to plant so we’ll see what happens with those next spring. I’ll put a few of my snowdrops the patio and see if they bloom earlier. Interesting tip. Thanks. I love the brave little crocus. Out before any other of his kind. 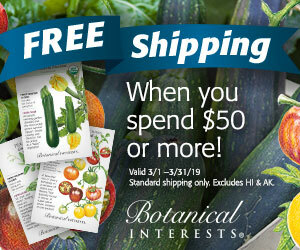 I really need to plant some of these, but my squirrels have such a taste for them. I am glad your plants have pushed their selves up out of the mud and snow and spring is coming to your part of the world. Last year I took photos on 3/29 to record how much snow was still covering the garden. 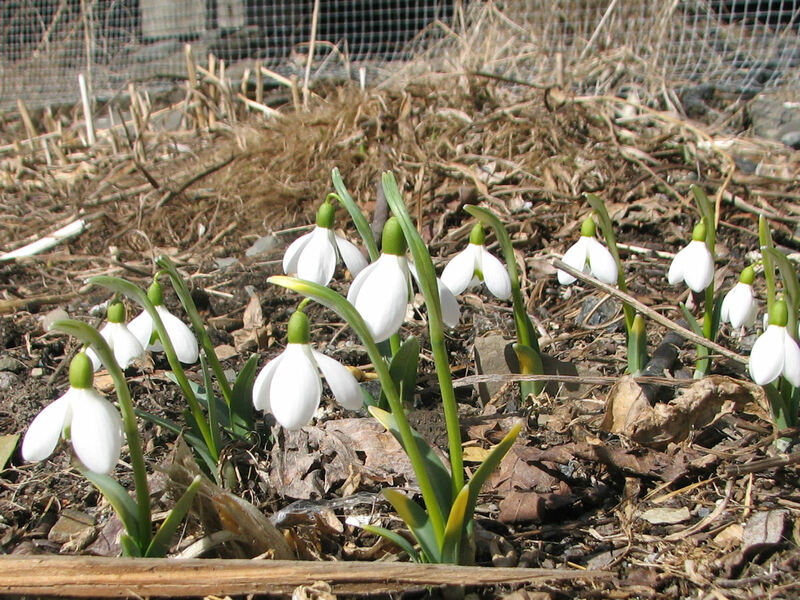 This year I have snowdrops on 3/15! I moved mine from the north side (duh!) to the south side near a window a couple of years ago. Can’t believe the difference it made! 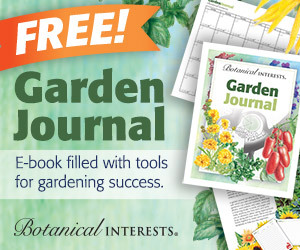 Hi Kathy, there must be some magic happening over there in the secret garden–great ROI on one bulb. Our snowdrops are a little like that, since we didn’t even know they were here, and they’re coming up all around the house, in the grass, and out by the shed. Such a lovely thing since the crocus are taking their time. But hey! Colchicums are sprouting, oo, and they look meaty! Last year was just the worst in a long time. I reviewed my records & found that things were later last year than this year. Of course, things are still late this year by normal standards. You have a nice group of Snowdrops. I’ve never grown that cultivar. Cindy, you should know I had to lay on my belly on the wet ground to get that shot. It is no higher than a crocus. But I agree, the intricate interior of the flower is really cool. Love the Heucheras! Those count as blooms to me. Put everything in a pot and cook until the Kale is tender! Yum! Your photos make me wonder if any snowdrops still grow in my Illinois garden. Like yours, the patch that bloomed first was near concrete. They were under a Mountain Ash tree, close to the sidewalk and front porch. Investing in Galanthus ‘S. Arnott’ was wiser than most other investments. What an increase! I’m totally enamored with the heucheras. I have one in a large container that looked good through most of the winter until recently. I guess everything needs a bit of a rest sometime if only for a few weeks. Donna, the ‘Pistache’ on the northwest side of the house is the one pictured. I have another one in a west-southwest exposure that looks burnt to a crisp and makes me wonder if it will come back. Location seems to be everything with these plants. When they’re good, they’re really, really good. I really need to get some snowdrops in. 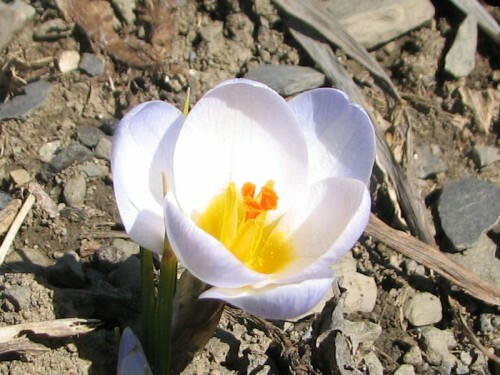 And my earliest crocus bloomed this morning. Purty little yellow ones. Love the Terra Nova intro – gorgeous color! Donalyn, the best way to get snowdrops is as a passalong. They “take” better if planted in their new home while the leaves are still green. I have some golden crocus, but those pale silvery blue ones are even earlier. Your flowers are lovely. I have a question for you. Last fall, I planted crocus beneath my forsythia bush. This spring, I checked on them and found holes where the squirrels had dug them up! This is the second time I’ve tried planting crocus …always the same results. Do you have a secret? Scherrie, the closest thing I have to a secret is that most of mine are planted in subsoil, which is hard for both critters and humans to dig in. See my crocus bank essay for details. Well I hope my snowdrops get to that stage soon. I had to replant. 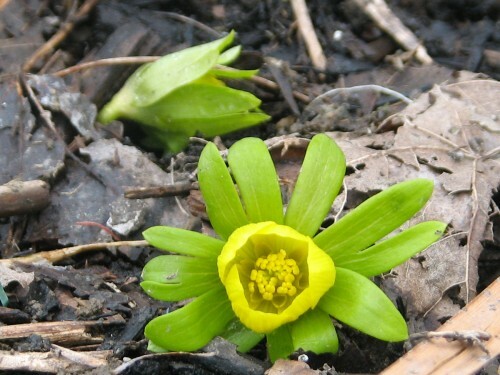 This winter aconite is intriguing: looks like a must-have plant to me. eliz, I hope yours get to that stage soon, too. If you divide after every season they are supposed to proliferate more quickly. I think it’s fascinating to find the little microclimates in our gardens. Just 10 feet can make such a difference. And I really love to see the plants I’ve heard about but will probably never see in my garden! Linda, it seems like the more extreme the climate, the more microclimates matter, too. Our area fail to reveal many snowdrops this season. Hope it is only temporary with a return next year. Love the aconite. My fave, but hard to grow there. I had a successful transplant last year from a friend, but it failed to return. Helen, I have had a lot of trouble with them in the past, too. This is the second year for some of them and the first year for the passalongs.